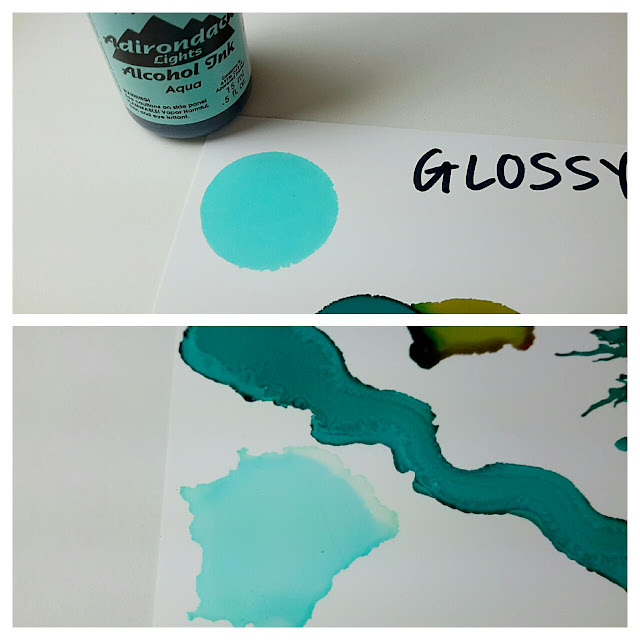 I've been asked quite a lot recently if you can use alcohol inks on glossy card stock rather than Yupo, as it appears not everyone is able to get their grubby mitts on my new found 'paper' of choice. I hope my comparison helps to answer many of your questions but please remember I'm in no way an expert, these are just my findings with my experiements. I'm working with Ranger's alcohol inks and showing the difference in 'movement' on 110gsm Yupo, which is a very lightweight, flimsy 'paper' and glossy cardstock that was sold to be used with alcohol inks. This time I dripped another drop and puffed the colour about with my Tim Holtz air spritzer. As the ink on the GLOSSY drys incredibly quickly you have to move in with the spritzer almost immediately. 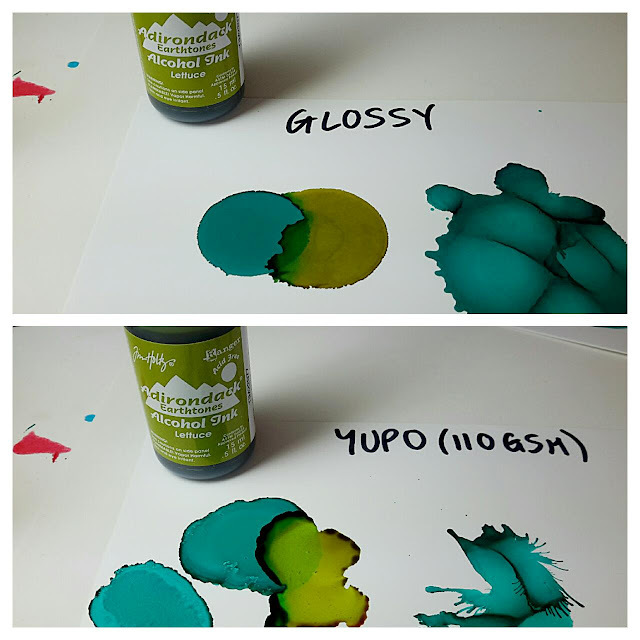 The ink on the YUPO doesn't dry as quick so you have more time to puff your ink in different directions before it drys. On this example I 'drew' a wiggly line with the ink and allowed it to dry. Again on GLOSSY the ink moved, dried quickly and left a bold, solid block of colour. On the YUPO the ink moved but once more you're left with this kind of sliced stone look with layers of slighty different shades and texture too. Now I decided to drop 1 drip of Lettuce right next to my first dried drop on ink. The green on the GLOSSY again formed a good circle and merged slightly with the Mermaid. On the YUPO the lettuce seeped into the Mermaid and created its own deeper green edge where the colours met. I will do another experiment in a different post about merging colours as that's another game to play. 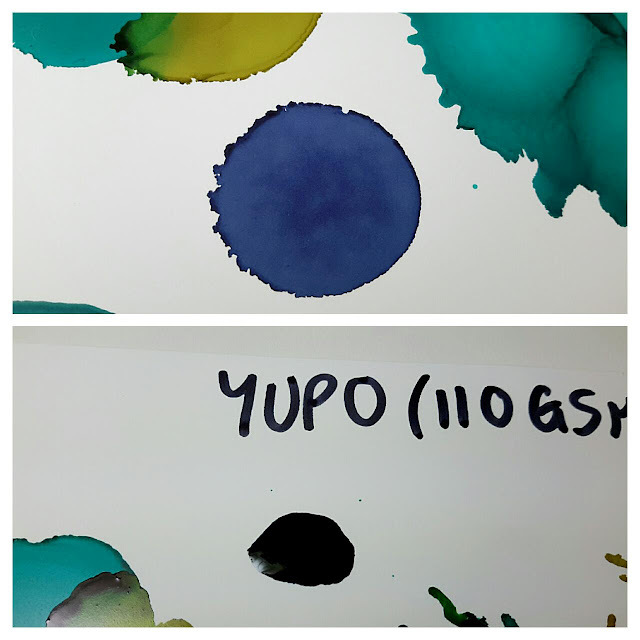 I find a lot of time on YUPO that new colours are created when 2 colours meet but you don't always get the same effect on GLOSSY. 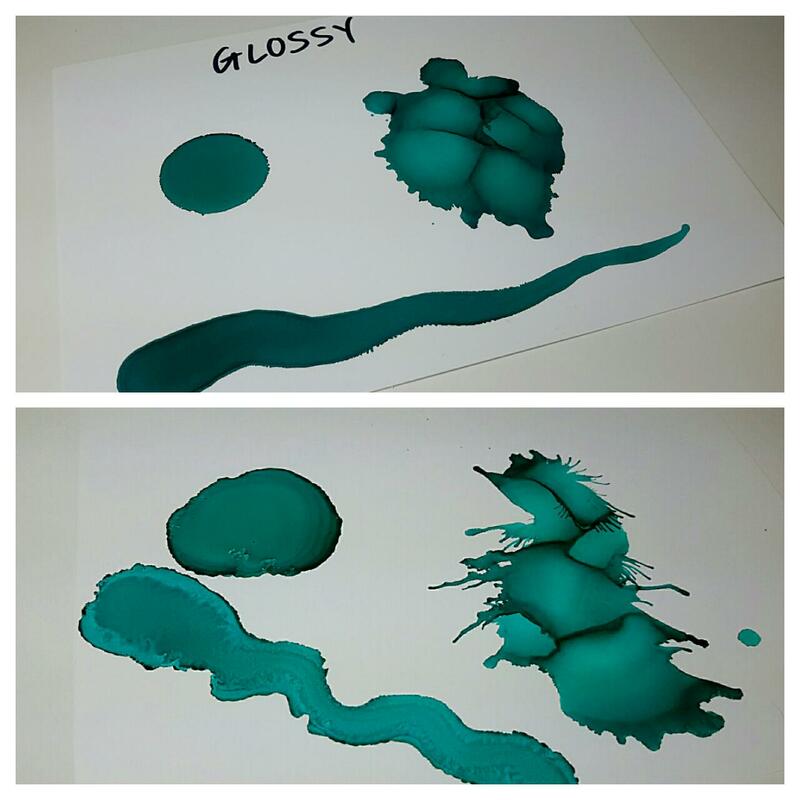 In order to show again the difference with puffing inks I dripped another drop of Lettuce on both papers. The result was the same as above. 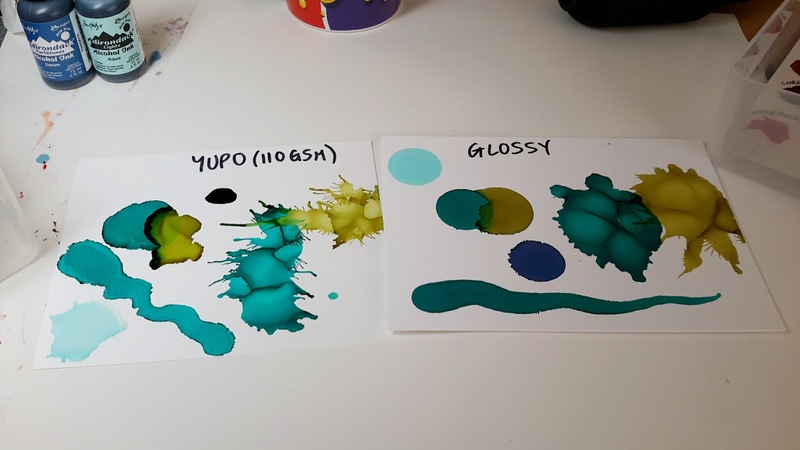 You have far more time on YUPO to make those colours move and create magical looks. Some inks have a kind of 'glow' about them when dry. For example, on some blue inks they will have a pink edge to them or a yellow ink may have an orange glow. 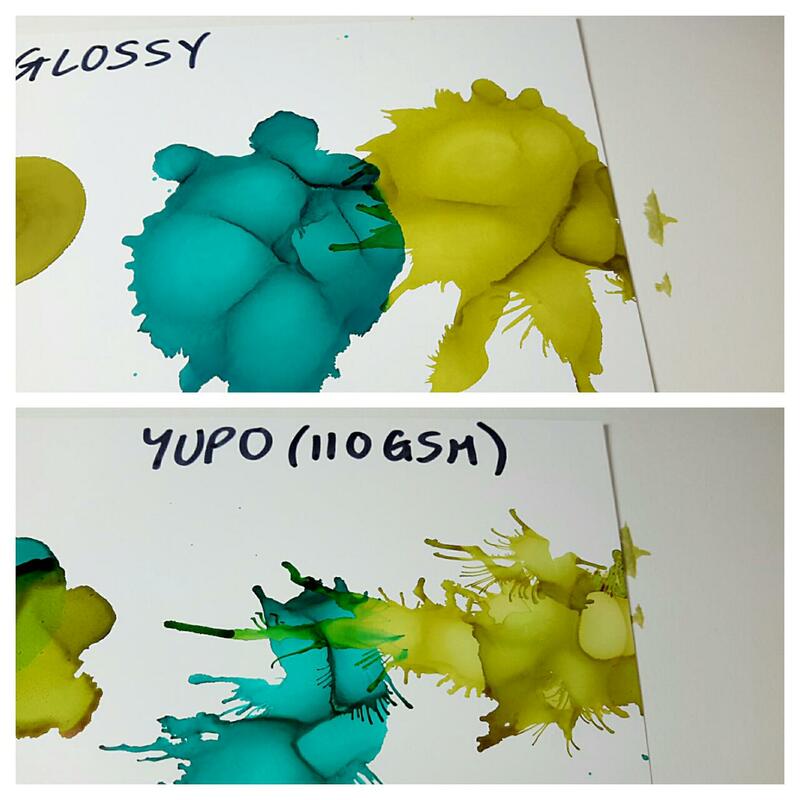 The glow seems to show up much better on the stiffer, more expensive 74lb YUPO (which I think is 200gsm). So here I've dripped 1 drop of Aqua on my GLOSSY & YUPO. 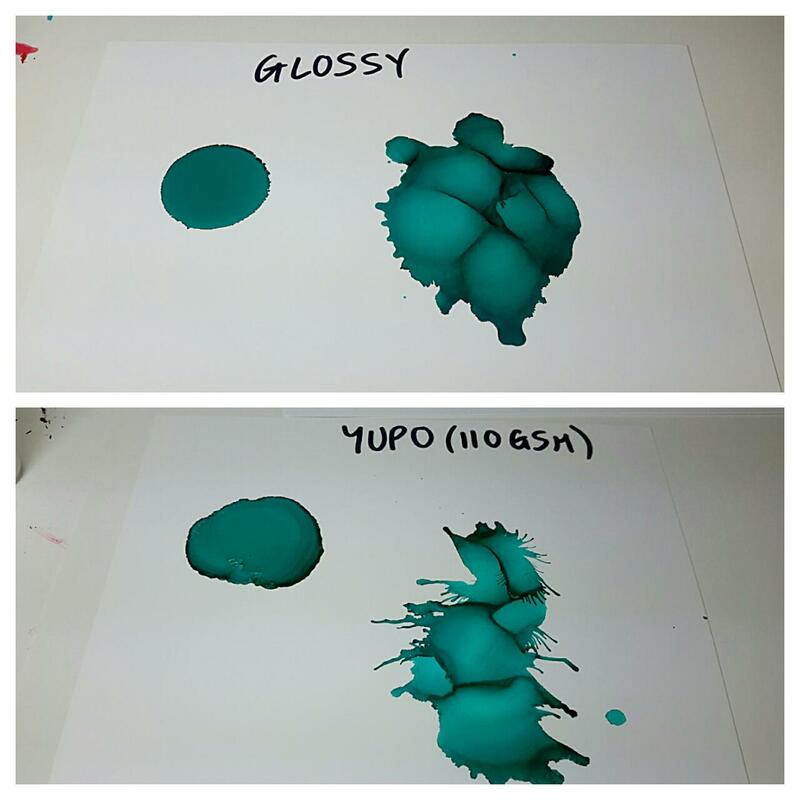 On the GLOSSY it's just solid blue but even on the lighter weight YUPO there is a very pale green edge to the ink. Now this is bizarre....for some reason, certain inks on the 110gsm YUPO just refuse to budge unless you tip the paper or blow it. 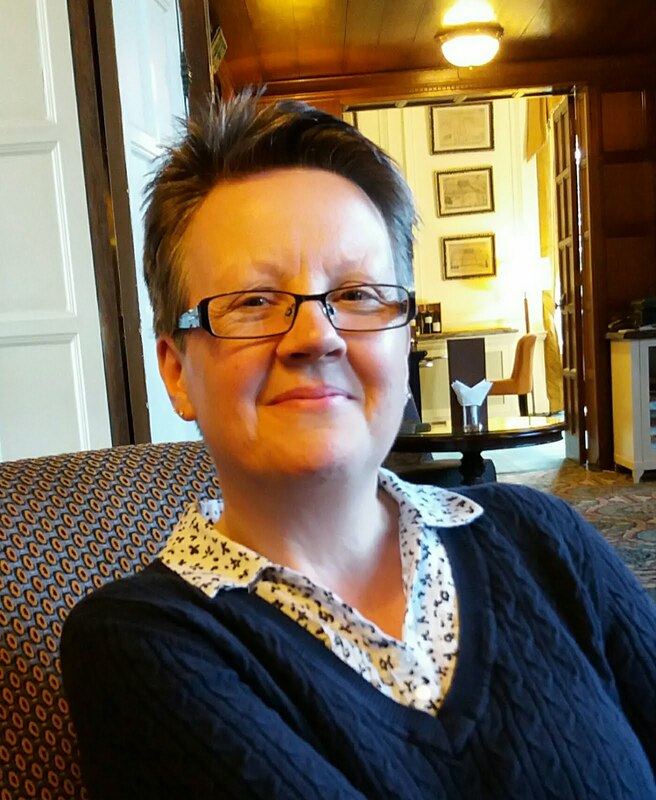 (Wagging a pointy finger is hopeless!) Here I dripped 1 drop of Eggplant and it reacted as per on the GLOSSY in a nice, neat, solid circle. On the YUPO it did nothing, nadda, zilch and here I am an hour into writing this post and it's done nothing. 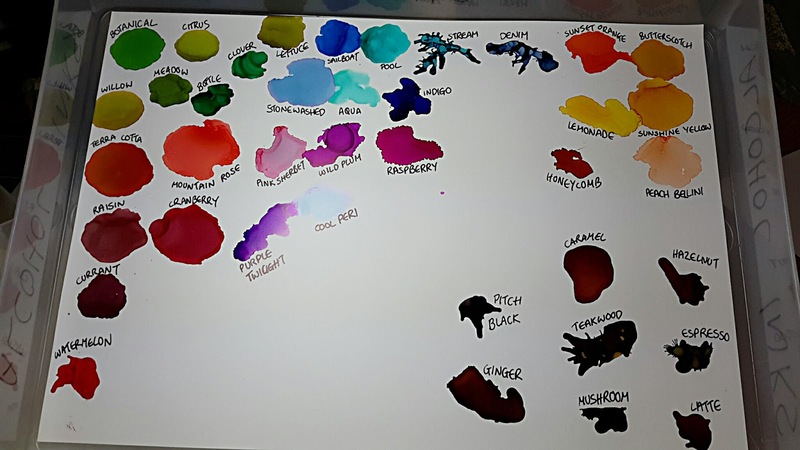 This is my temporary colour chart and you'll easily be able to see which colours moved on the 110gsm YUPO, and which little blighters didn't, as I've had to puff the colours about. It seems to be mainly the browns and a few of the blues and I have no idea why. In summary if you can get your mitts on YUPO of any kind then I would say do that. The 74lb gives you more options but if like me at the moment you're getting a huge kick out of blowing your inks about, then the cheaper 110gsm is perfect for that technique. As the 110gms is so flimsy I stick my pieces on scrap card for better control. The inks are not absorbed by the YUPO at all which is why I think you get a far superior colour finish. Yes you can use GLOSSY but you have to work uber-fast. If you try YUPO just once, I promise you will never look back. Thank you for this great comparison! I've been following your adventures with alcohol inks & Yupo with great interest as I have a slew of Tria inks and a major stash the old King James glossy cs from the days of playing with the Polished Stone technique...which I love! So this new paper is very fascinating...haven't bought yet...but ever so tempted. I've had excellent results, however with the glossy and compressed air... Feel like such an abstract artist (which I'm not). Your artwork is gorgeous. 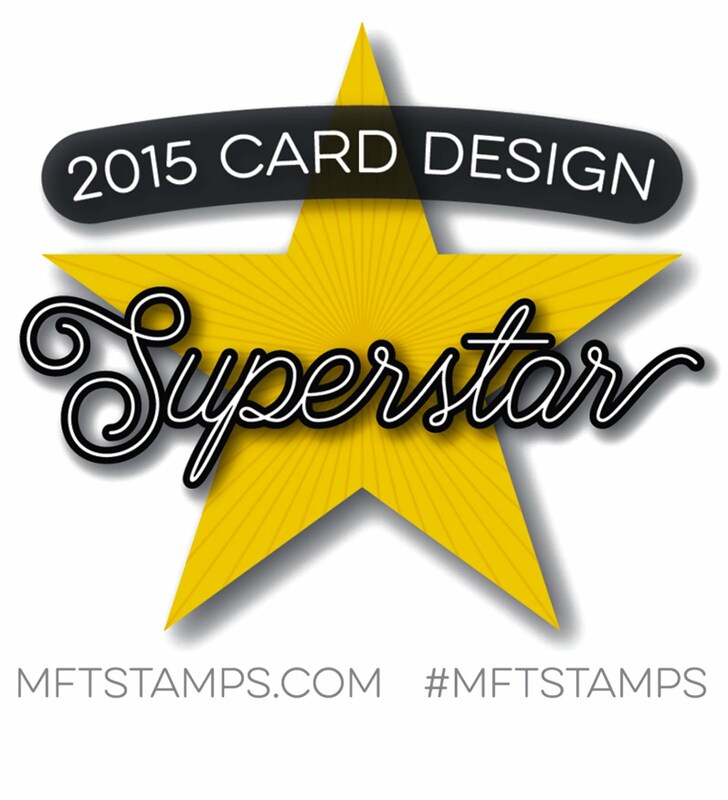 Stumbled onto your site and have been inspired. Got to find me some Yupo! Thanks for the comparison. 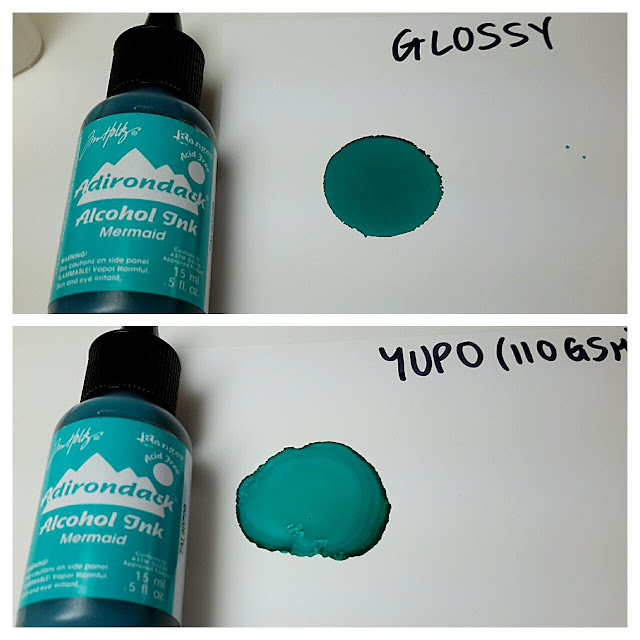 I know I'm about a year behind but I've decently been hearing about yupo for alcohol inks, but your blog is the first I've read showing how it's different to the "regular" alcohol ink paper!